Congratulations! You made it to the finish line and now enter the most exciting phase of your project; delivery! 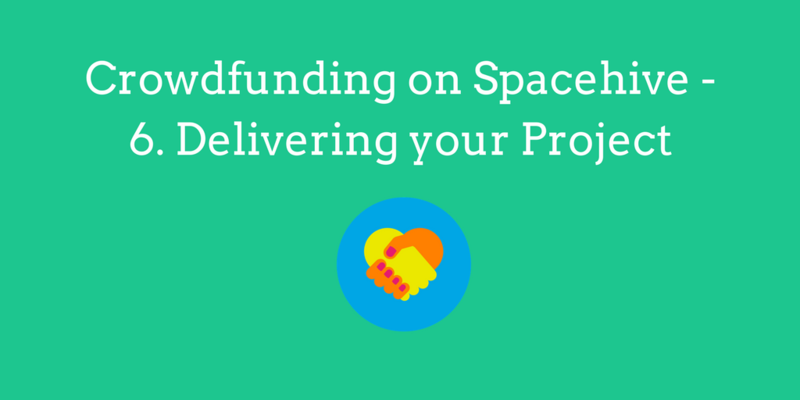 Through crowdfunding, you’ve raised the funds needed to deliver the project as well as engaging the community in shaping their local area and raising the profile of your project. First things first, you deserve to celebrate your success. High fives, hugs and hard liquor are all options. Once you’ve had time to enjoy the victory it’s important to take the time to thank your backers and supporters. Use all your campaign tools to celebrate the success of your campaign – send out an update via Spacehive, share on social media, post as a blog and let your media contacts know all about your success. On hitting your target, we’ll send out an email to all backers letting them know that their pledge will be collected in a few days, so that they can make sure they have got sufficient funds in their account. At this point you should also check that your GoCardless and/or PayPal accounts have been verified, otherwise this can delay payment. We will then collect the pledges and send them over to your designated bank account. GoCardless pledges will be deposited in one complete sum while PayPal pledges will all be lodged individually. Your Project Delivery Manager is now legally obliged to deliver the project as set out on the project page. If worst comes to worst and the project can’t go ahead, then all pledges must be refunded. Over the course of delivering your project, keep your backers updated on your progress sharing photos and stories. When your project is open for visitors, let your supporters know they can come check it out. Receiving funds: On average 1% of pledges fail, either because the backer has cancelled their pledge or did not have sufficient funds in their account at the time of pledge collection. We will chase these individuals and try to recollect their pledges, but cannot ensure 100% collection rate. Ready to go again? If you want to capitalise on the success of your first campaign and are ready to launch a follow-up, then look to get your next project page up and verified by the time you hit your target, so you can use the momentum of your success to launch your next phase with a bang. The Renovation of Wanstead Playground is a great example of a phased project. They ran three campaigns raising £13k, £25k and then £46k in quick succession from a total of 380 backers! Once you’ve delivered your project, use our impact reporting tool to capture the next chapter of your project and the positive impact it has made.